Cookies "Kuhmaster "Petit beurre chocolate"
Who doesn’t like cookies? It is a very common tradition to eat cookies with tea or coffee and treat your guests. It is a hand-held sweet baked dessert that usually consists of flour, sugar, butter or other fats. Also, cookies can include some additions: chocolate, cocoa, raisins, nut, coconut chips, marmalade or flavors like ginger, cinnamon, etc. Cookies could be homemade or handcrafted. 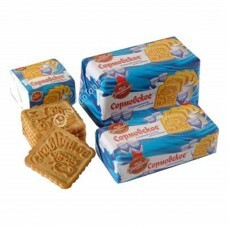 They are sold in small bakeries, but they can also be found in almost every store. There is an interesting story, how the cookies were invented. It brings us back in times when there were no ovens with regulated temperature. To prevent spoiling of the whole cake, small pieces of cake were baked first. That is how the first cookies appeared. Russian cookies are mostly based on flour. Such kinds of cookies as macaroons, which are prepared with eggs whites are not so well-known and popular in Russia. Traditional Russian cookies are biscuits, sandwiches with two cookies and filling between them, soft butter cookies, crispy cookies or bar cookies. Let’s talk more about cookies that are loved by Russian people and their taste will definitely get under your skin. Have you ever heard about cookies in shape of nuts with condensed milk inside? It really is worth trying if you haven't done it before. Another traditional Russian cookie is a cookie called Pryanik, also known as a spice bread. It is sold in the stores all year, but traditionally it is the main dessert on Christmas table. It is commonly decorated with egg whites. Well-known Tula pryanik looks like honey bread with some jam inside and beautiful decorations and symbols on the top of it. Oatmeal cookies are also very popular in Russian cuisine. This kind of cookie is based on oatmeal and is made of some additional ingredients like raisins or chocolate. Oatmeal cookies are the kind of drop cookies, which are prepared by dropping dough on the baking paper using a spoon. If you like cookies, but struggle from diabetes you still can find some options of cookies, made without sugar or with fructose sweetener. Also if you have gluten intolerance, you can find cookies marked “Gluten Free”. 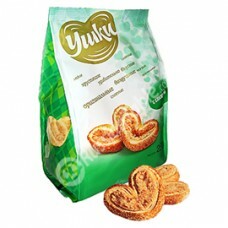 Russian pastry factories produce a great variety of cookies that will definitely satisfy everyone. When choosing cookies for a tea, pay attention to the bar cookie with the taste of butter, baked milk or cream. These usually soft square cookies will definitely make you want to try more. So-called Russian tea cookies are cheap, simple but very tasty. The popularity of these cookies probably came from the times of the Soviet Union when people baked cookies with low-cost ingredients. Children were also engaged in the process of baking cookies and the traditional way how to eat those cookies is with tea and in a family circle. If you like sweet desserts, you will be satisfied with a great variety of Russian sugar cookies. Tea cookies can be used as ingredients for some other recipes, like cheesecake, Napoleon cake and others.